Every year with the arrival of Fall comes for many the end of the golf season (except in Florida, when it begins). For those who have put away their golf clubs, staying connected with the game they love becomes difficult as the days get shorter and the weather colder. There are remedies to this problem, however: First is the Golf Channel with its comprehensive lineup of interview and golf news shows, lessons and clinics, tournaments from around the world and the Big Break. Then there are the many golf magazines that include articles like “Add 20 yards to your Drive”, “Making the Perfect Bump and Run” or “Never Three Putt Again”. And, of course, are the hundreds of “how to” books and memoirs by the great professional players of yesterday and today. As to the latter, it is not surprising that many golfers have a good number of these books stacked nicely in their library for reading by the fireside during a cold winter evening. This leads to another aspect of golf that makes it unique from other sports: Its relationship with the arts. Ever since the first ball was stricken somewhere in the wilds of Scotland, the game of golf has lent itself to the arts, both literary and visual. Books have been written about golf. Many a notable quote has been made by the famous and infamous about golf. The words of golfers and non-golfers alike about golf can lend credence to the notion that “golf is the microcosm of life”. And this could lead to spirited debate. But its not only words. The beauty of the golf course, with its surroundings created by nature, lends itself to visual presentation, and many a painting or photograph has featured the quiet solitude of a fairway or the lonely golfer agonizing over a shot. Unfortunately, however, while the literature of golf is well represented, not so much with the visual arts. Until now. 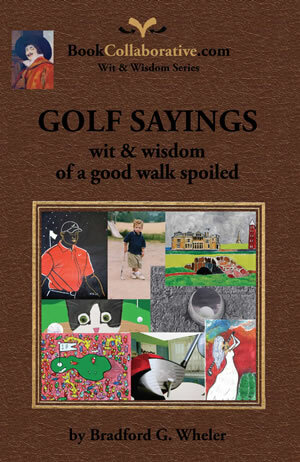 Bradford G.Wheler has just added a new book to his BookCollaborative.com “Wit & Wisdom Series” with Golf Sayings: wit and wisdom of a good walk spoiled just published by BookCollaborative.com. “GOLF SAYINGS: wit & wisdom of a good walk spoiled is an exciting and vibrant collection of golf art and text designed to celebrate golf and the people that love the game. Author Wheler achieves these two goals with great success. First, the quotes selected were carefully chosen and skillfully presented within the book’s ten chapters. From the first quote in chapter one, “That’s Golf”, Wheler kicks off with one of the most famous of all golf quotes, “Golf is a good walk spoiled” by Mark Twain. It gets better. And as the reader becomes immersed in the words he or she can pause and admire the artwork that appears on nearly every page of each chapter. The second chapter entertains the reader with quotes from professional golfers followed by a chapter on golf humor, always a favorite. Chapter four, “Winning & Losing” ends with an interesting quote from Dave Williams,”If you want to beat someone out on the golf course,just get him mad.” Chapters five and six deal with the two biggest elements of the game, Sportsmanship and Frustration, with the latter something experienced by nearly all golfers during every round they play. The artwork in these chapters compliment and cleverly illustrate the sayings quoted. Chapters nine and ten ends the book with quotes from four of the greatest golfers, Hogan, Jones, Nelson and Snead in chapter nine and finally “The Back Nine” in chapter ten. For many golfers, even one good shot on the back nine is enough to bring one back to golf, inspite of the horrible front nine. The sayings in Wheler’s book are classic. So, too, is the artwork. One of the goals of Wheler’s series of books is the promotion of the visual arts. In his earlier books this was a prominent feature. In Golf Sayings, it continues with relish. Among selected artists whose works are featured in “GOLF SAYINGS” are Christine LaGrow from Southern California who’s captivating landscapes add so much to the book, and Lesley Giles an artist from England who has “walked inside the ropes” with top golfers including Tiger Woods. Christine got her inspiration from living in the Lake Tahoe area and the Napa Valley wine country of California. Lesley is primarily a landscape painter inspired by solitary places and isolated objects. 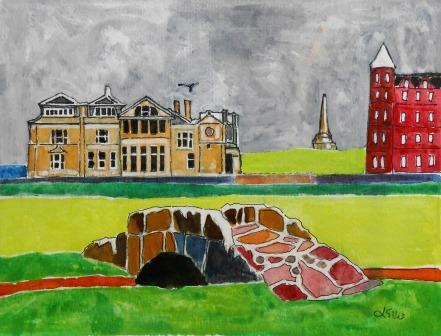 She was encouraged in golf art by her husband (an avid golfer) who could see a potential for her to make paintings of golf courses, which, to her, are very strange but tantalizing landscapes! 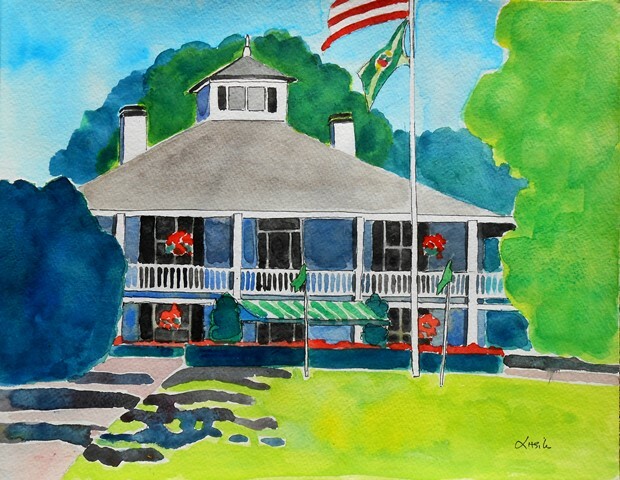 Her work appears throughout the book, including paintings of Tom Watson and Tiger Woods, as well as famous golf courses such as Augusta National and St Andrews. This book is a valuable addition to the golf literature and will fit well in any golfer’s library. The artwork included is an extra treat that is a unique and welcome feature. Enjoy! The book is now available and Lesley is offering exclusive signed copies here.